BOGOTA, Colombia — An avalanche of water from three overflowing rivers swept through a small city in Colombia on Saturday night while people slept, destroying homes and killing at least 250 unsuspecting residents, [and injuring hundreds more]. 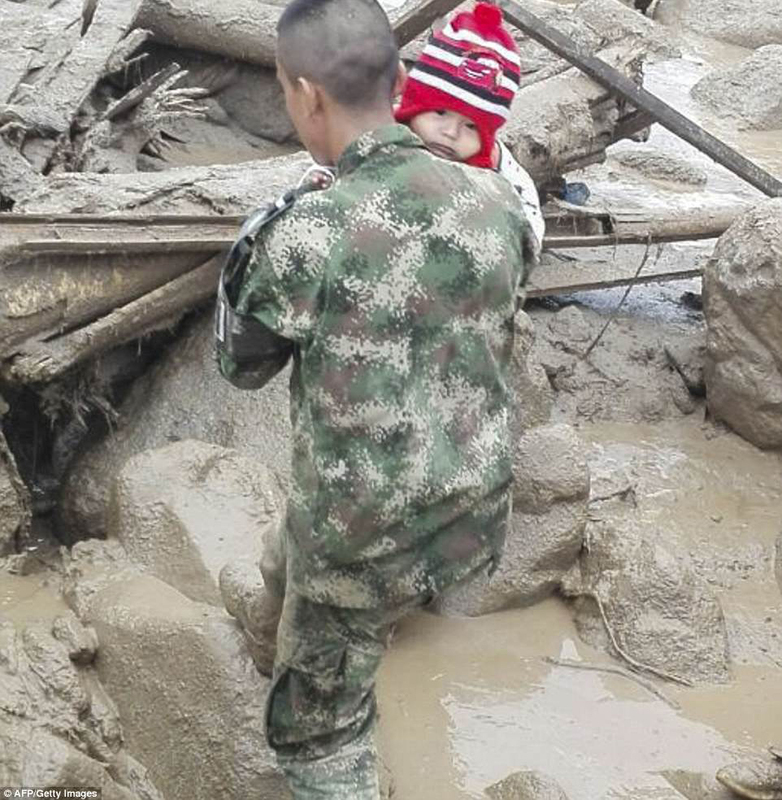 The incident triggered by intense rains happened around midnight Saturday in Mocoa, a city of about 40,000 tucked between mountains near Colombia’s southern border with Ecuador. Families and rescuers searched desperately on Sunday through mud-plastered rubble for victims. Volunteers and firefighters tended to 82 bodies downstream in the town of Villagarzon and said many corpses were still caught in debris. What happened in Mocoa is known as a “debris flow,” which came during an unusually wet season, topped off with a shorter period of intense rain, U.S. Geological Survey (USGS) landslide scientist Jonathan Godt said. He said he reviewed images and video of the Mocoa disaster, noting the mountains surrounding the city. Witnesses reporting hearing buildings shuddering and vibrating as the flow crashed through Mocoa. Scores remain missing since the deluge struck after midnight Saturday when many people were sleeping, washing away trees, vehicles, houses and everything in its path. Pictures posted to social media show bridges wiped away, piles of debris in the town center and overturned vehicles tumbled amid tree limbs, rocks and fencing. 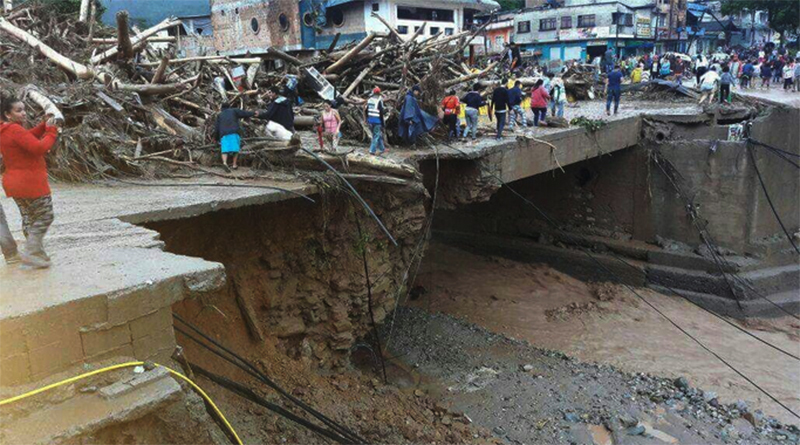 [The slides washed away power stations, knocking out half of the electricity in the department of Putumayo, where Mocoa is located. The city’s water network was also destroyed.]. The avalanche is the fourth-worst weather-related disaster to ever strike Columbia, said Jeff Masters, director of meteorology for Weather Underground. He said the damage is great because the city was built in a potentially dangerous location: at the bottom of mountains, alongside a riverbed. [Even in a country where heavy rains, a mountainous landscape and informal construction combine to make landslides a common occurrence, the scale of the Mocoa disaster was daunting compared to recent tragedies, including a 2015 landslide that killed nearly 100 people. Colombia’s deadliest landslide, the 1985 Armero disaster, killed more than 20,000 people.]. Godt, who has created small-scale landslides in Oregon for research, said debris flows like this one can be more devastating than a flood because the water gives the flow speed and the debris gives it extra punch. He said the flow would have been loud: Think water rushing, boulders crashing and trees being torn apart. Godt said flows like this happen anywhere there are mountainous regions. He said the damage varies depending on how steep the surrounding hillsides are and whether trees or other vegetation help “anchor” the wet soil in place. Hillsides burned clean by forest fires or clear-cut via logging tend to be at a higher risk for slides, he said, because there’s less to retain the soil. Masters said the fact the disaster struck at night further compounded the danger: People waking up to such a calamity might have had no way to escape the flows. “The debris impacts the houses, knocks them down, so you have a much lower chance of surviving,” he said. Reprinted here for educational purposes only, from USA Today, with bracketed excerpts from CBS News and Reuters. May not be reproduced on other websites without permission from USA Today. NOTE: See map and videos under "Background" and "Resources" below the questions. 2. a) Where is Mocoa? - What is the population of this city? b) How many residents were killed in the avalanche of mud and water that flowed through the city Saturday night? 3. In addition to the hundreds killed and injured, what other damage did the mudslides cause? Be specific. 4. What led to the landslide, according to U.S. Geological Survey (USGS) landslide scientist Jonathan Godt? 5. a) Why was the damage so great, according to Jeff Masters, director of meteorology for Weather Underground? b) What is your reaction to this information? 6. How does USGS scientist Jonathan Godt explain this natural occurrence? 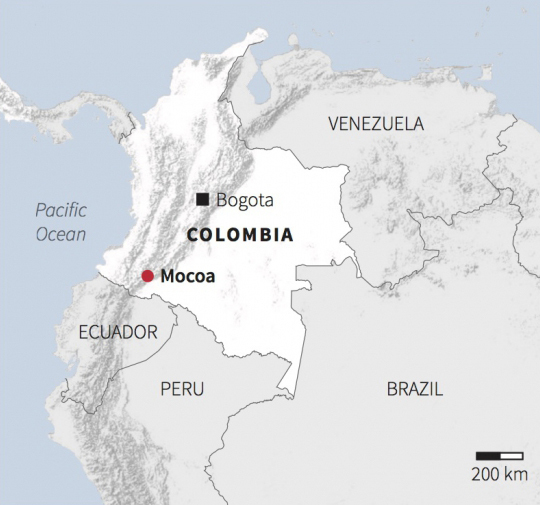 Mocoa is an important agricultural hub and base of operations for multinational oil companies in southern Colombia. Eyewitnesses claim there is severe devastation in 17 neighborhoods. 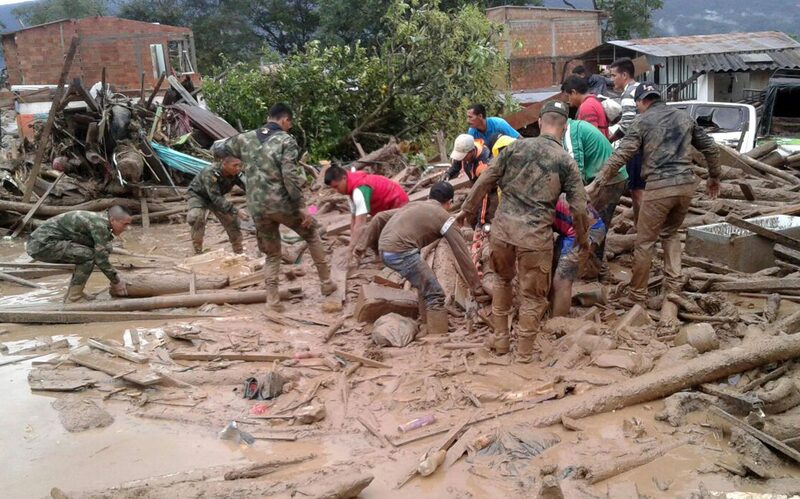 More than 1,000 soldiers and police were helping to recover bodies and on Saturday afternoon the first shipment of humanitarian aid arrived in Mocoa from the capital, Bogotá.